Benidorm is situated in a privileged position on the Costa Blanca in the province of Alicante, it has the stunning Sierra de Aitana mountain range as a backdrop and which provides a mild climate even in through the colder months. Long sandy beaches, plenty of eateries, pubs, shops and cafes have helped make Benidorm the most popular beach resort in Spain. And away from the madding crowds there are plenty of opportunities to explore the more traditional Spain. Then there’s the nightlife with lots of bars, nightclubs, cabaret shows and karaoke bars to choose from, so whether you want a quiet drink while watching the world go by or you prefer getting up on stage to belt out a song or two, there is something for everyone. We have compiled a comprehensive Spain travel resources page to help you plan and book a trip or holiday to Benidorm including a budget busting hotel search comparison platform, travel insurance, flights, discount car hire, tours, excursions as well money saving travel and holiday deals. Benidorm was Spain’s first resort for package holidays when the mayor, Pedro Zaragoza, set about transforming a sleepy fishing village in the 1950’s into a major resort. He played his ace by allowing bikinis on the beach and 6 decades later the town still attracts more than 5 million visitors a year. The traditional drink of Horchata is not actually Spanish but was brought to the country by the Moors centuries ago, made from crushed tiger nuts, sugar and water, you can buy it in cafeterias and ice cream bars. There are two main beaches at Benidorm are the Levante in the new town and Poniente in the old town. The World Health Organisation considers the Costa Blanca to have one of the best climates in the world health wise thanks to its warm temperatures, low rainfall and clean air. Within Europe only Milan and London boast more skyscrapers than Benidorm, the Gran Hotel Bali is the tallest hotel in Europe standing at 186m high. Benidorm really is a mega resort, with the local hotels offering over 35,000 beds with thousands more being provided by self catering apartments, hostels and other alternative accommodation. There around 1000 restaurants to choose from plus some 30 discotheques, an amazing nightlife to suit everyone, some great golf courses and long stretches of quality beaches to choose from. 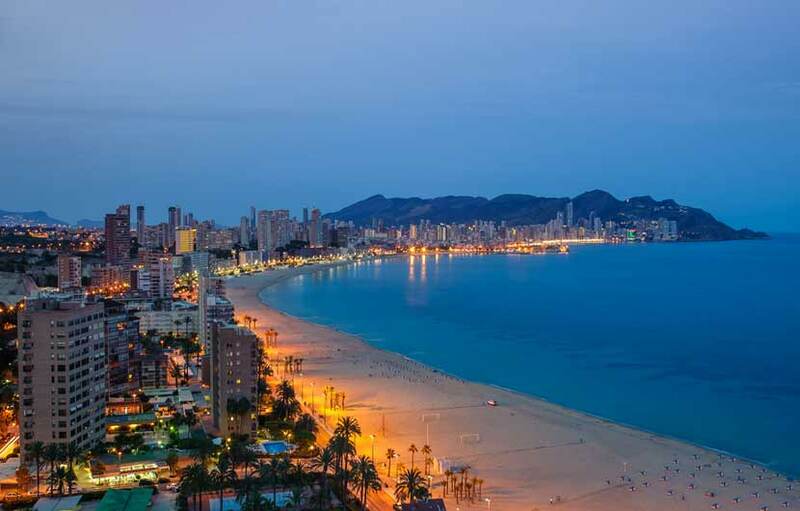 Benidorm is glitzy, hyperactive, loud and, to put it kindly, unpretentious to the extreme, it is renowned for its boisterous night-life, cheap and cheerful dining and hoards of sun-crisped tourists swarming its streets and beaches. However, Benidorm is Spain’s top holiday destination for a good reason: it offers sun, sea, sand and – most importantly – fabulous fun for all ages at unrivaled bargain holiday prices. So, if you’re looking for a wild and carefree break away that offers splendid weather and cheap package deals, it may be time to put aside your misgivings and give Benidorm some serious consideration. 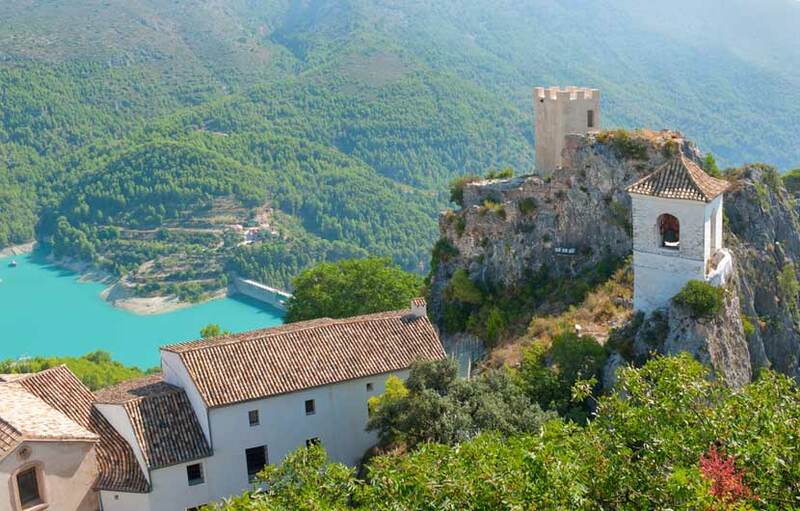 This charming village of Guadalest is located in the Sierra de Aitana mountain behind Benidorm, and is an absolute delight to visit. This small picturesque mountain village measures just 16 square miles and with a population of just 200 is one of the places where you feel like you are stepping back in time. Aqualandia , the largest water park, also resides in Benidorm! The waterpark provides welcome relief from the heat, and offers an overwhelming array of exciting and action-packed water slides and pools. Marine and animal park Mundomar is right next to Aqualandia, and offers yet another wonderfully unique day out. The park is home to a range of cute and quirky animal species and offers some extra-special experiences, including up-close-and-personal encounters with dolphins and sea lions. One of Spain’s best theme parks, the ever popular Terra Mitica is just a short drive from Benidorm and with its 5 themed area and multitude of rides and other activities it really is a must do when in this area. Unsurprisingly, Terra Mitica , Spain’s biggest and wildest theme park, is at home in Benidorm and caters for all ages, offering a range of thrill-rides for adrenalin junkies and gentler rides for younger children, making it great for families, teens, couples or groups. Designated a natural park in 2005, this expansive area of greenery is a sharp contrast to the concrete of the resorts in the area. With its fascinating flora and fauna a trip here is the perfect antidote to the craziness of Benidorm. A 10 minute boat ride will get you to the mysterious rock you can see looming offshore called Peacock Island. See the birds and walk around the island and enjoy looking back over Benidorms shimmering high rise skyline, you can also take a fascinating journey beneath the seas in the Aquascope vision submarine to discover the underwater sea life. Also recommended is a boat ride along the coast to Calpe which lies in the shadow of the majestic Peñon de Ifach, an impressive large rock jutting out to see off the Calpe Coastline. It is in fact a declared National Park since 1987 where over 300 species of flora can be found. You can also climb to the top up the winding pathway to the top where you will be rewarded by spectacular views over the beautiful town of Calpe. One of undeniable main attractions for holidays to Benidorm are the beaches, and the principal reason so many people visit and return each year. There are two main beaches the Playa de Poniente and the Playa de Levante which are some 5 kms long and offer golden clean sands, the Playa Levante can get pretty crowded during the hight season ( July- August ) , the Levante Playa is backed up by a broad promenade and lined with a large selection of Bars, Cafes and Restaurants. Mal Pas is a smaller beach beneath the port and the castle cliffs. La Cala is another quiet sandy beach. Needless-to-say, there are water sports aplenty in Benidorm, and activities such as jet-skiing, water skiing, sailing, paragliding, sea-kayaking and good old banana-boat rides make up the plethora of choice and all provide a great way to cool off in the sunshine. Benidorm also offers cable-skiing – an easier alternative to traditional water-skiing for those who want to be zipping across the waves a bit quicker. Want a break from the sea and sand? Benidorm offers bike hire and cycle tours, as well as horse-riding and Nordic walking through the pretty, often over-looked nearby countryside. Explore the old Benidorm near the castle where you will find plenty of pubs along the Calle Vicente, plus some great discotheques , night clubs and other music bars to pass away the night. Benidorm is renowned for being a hit with stag and hen parties, which is testament to the crazy, varied and spectacular nightlife it offers. Catering for just about every partying preference, Benidorm has karaoke bars, Irish pubs, Country and Western bars, cabarets and show bars – as well as an impression selection of your “conventional” pubs and clubs!. 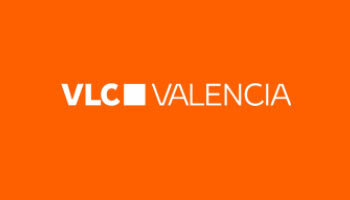 Head down to the Avenida Communitat Valencia, only a short taxi ride from the beach front, for a night of partying as the best nightclubs can all be found here. Other lively drinking hotspots are around the Square (Avenida de Mallorca), which hosts a great selection of bars, shows bars and clubs, and the eclectic bars of the Playa Levante promenade. Another must place to visit is the Benidorm Palace where you will be entertained with a glittering three hour Las Vegas-style show. Spanish dancers and flamenco, jugglers and magicians are just some of the quality acts on offer.